5 September 2014 — Usually summers are relatively quiet here at SOAR; young kestrels and screech owls that need a little food and flight time; the occasional Coopers hawk and window collision, red-tailed hawks and car collisions, baby vultures and hollow tree removal. Well quiet might not be the right word. But usually we do not admit any eagles. Lead poisoning is a fall and winter problem. Summer should be safe. It seems about every other year we will get in a young eagle that needs our help. So when Cynthia called that she was delivering a young eagle from Decorah, I thought, here’s our one. Thought too soon! Our summer eagle admits at SOAR are up to seven, six hatch-years and a one-year-old! In normal years, eagles do well – a secure nest, lots of parental care. They usually don’t need us for a thing. This summer was different and I’m hoping not to be repeated. Our first admit was the Decorah juvenile. On my first look over, I was not encouraged. I could feel the humerus fracture just below the shoulder joint, but it was not a compound fracture (bones sticking out of the skin) and he wasn’t extremely thin. So maybe he had a chance. Then I discovered the maggot infestation in the wound on his back just above the tail. It is a normal summer occurrence when birds have an open wound and are too weak to preen, the flies lay eggs, and the maggots invade. Several hours of manual maggot removal over the next couple days, with betadine and Neosporin for the wound and we had won the maggot battle! But they had invaded the tail feather shafts to get at the last bit of blood and destroyed the feathers. We could only hope that the feather follicles were intact and he would regrow those tail feathers. He needed a couple more days of food and fluids to build strength for a visit to our veterinarian, Dr. Dirks. An x-ray showed an oblique humerus fracture near the shoulder joint, but with a long enough piece of bone at the shoulder to warrant trying to pin the pieces together. Surgery and having a bird under anesthesia are always nerve wracking for me, but he made it through with flying colors and now just needed to stay quiet, eat, and heal. Then a starving hatch year female came in from Webster County, near Boone Forks (where the Boone River forks…) Park. The Conservation Officer answered the call and picked her up from the side of the road. She was so weak and starving, I wasn’t sure if she was going to be alive when we got back to SOAR. Amazingly with a little fluids and a lot of food, and some wormer for good measure, she steadily gained weight. She and Decorah bonded and I think they both felt more comfortable not being alone in SOAR’s 20 X20 foot intensive care area. Not the end of it yet. Linette picked up and delivered another hatch year male from near Independence. The landowner had been watching the nest and kept an eye on the young eaglets on the ground when they first fledged a little early. Of course hoping the adults would care for them on the ground. When he found two dead, he knew it was time to get the other one some care. This baby was very thin and started having seizures. A consult with Dr. Dirks lead to a diagnosis of West Nile Virus. If we can get nutrition in our West Nile Virus patients and they have some reserves left, they can fight it off. It is a lot like the flu and normal immune systems seem to be able to handle it. It was not to be, this little male had no reserves. What next, I thought. Remind me not to think that anymore, because, of course, there’s always a next. The Project AWARE, volunteer river clean-up crew, were the next to call. While canoeing the Little Sioux they came across a hatch year eagle standing wobbly next to his dead sibling. They gave him a canoe ride to the next boat ramp, where Tyler was able to meet them and bring our fourth eagle of the summer to SOAR. Project AWARE was thin, not seeing well out of one eye, and had a fractured ulna just above the wrist joint, oh my! Food, fluids, eye ointment, a vet visit (with the fracture not being pinnable), and some TLC got him through. He is just beginning to try to use his wing. Okay, really, four is enough…. 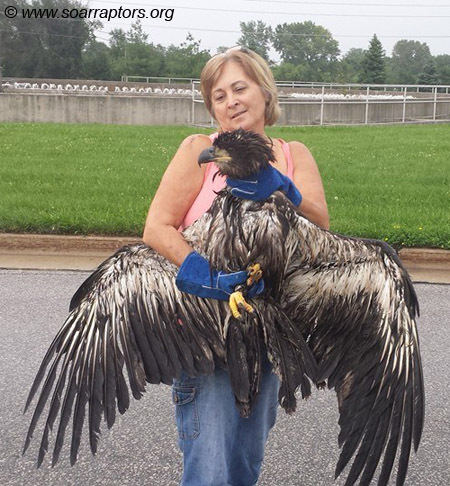 Glenda calls with another eagle, this time a one year old from Dickinson County. This female is not thin and is eating like a trooper. An x-ray shows an inoperable ulna fracture just below the elbow joint. Dr. Dirks gives a poor prognosis for the elbow joint functioning properly after healing. The Conservation Officer from Clay County calls, just as we were packed and loaded for a day of programs, with another eagle he retrieved from the roadside without a fight. Luckily, Terrie had just finished up releasing some kestrels and was off to meet the Officer. The Clay County hatch year female just wanted to sleep. I could poke her with my finger and she would only open one eye – with the “leave me alone” look. This is a classic West Nile Virus symptom. Then, just as she was on the road to recovery her breathing became labored and horribly raspy. Aspergillosis. A consult with Dr. Dirks confirmed that suspicion, as he had seen this before; a bird’s immune system is compromised fighting off one virus, leaving an opening for a fungus! Clay is getting daily treatments of the newest anti-fungal drug, this requires tube feeding her to make sure the medicine is dissolved and gets in the bird. I am not her favorite person right now, but she seems to be responding with less labored breathing and quite a bit of fight left over! Meanwhile back in the 20X20 ICU, Decorah juvenile has had the pin removed from his humerus and has had his wing in wraps for another week. It’s time to stretch things out and see what we’ve got. He is not wanting to move the wing on his own, so a little physical therapy is done. Joints seem to be working and we give him more time. A move to the large 100 foot flight pen is in order. He and Boone Forks adjusted well to the large area, eating and taking baths. Decorah still does not want to lift his wing at the shoulder joint, but is growing in some tail feathers. 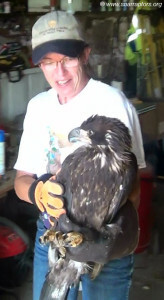 Then, hopefully, the last odd circumstance of the summer; a hatch year eagle trapped in a water treatment holding tank. She got in and couldn’t quite spread her wings out enough to get herself out. Iowa DNR staff came to the rescue and got her out. Deb was able to corral her and bring her into SOAR, for a bath and a few free meals. This Des Moines female has no broken bones, only a little slime. She will spend a few days in the big flight pen to be sure she is ready to go, then back to her nest mate and parents. With Boone Forks making full length flights in the flight pen and Decorah still not wanting to stretch out his wing fully, it was time for Decorah to have another visit with Dr. Dirks. An exam and another x-ray told us that the bone had finished healing with a nice calcified lump. Without the calcification we would not have a stable bone, but it is impeding his shoulder joint. Decorah did not have a lucky break, in the middle of the bone a calcified lump is no big deal, too close to a joint it means you will not fly. Every joint needs to work perfectly for wings to get you into the air. People can get by with a stiff shoulder, they can always learn to hold the fork with their other hand. Birds need fully functioning joints to survive in the wild. So now what? 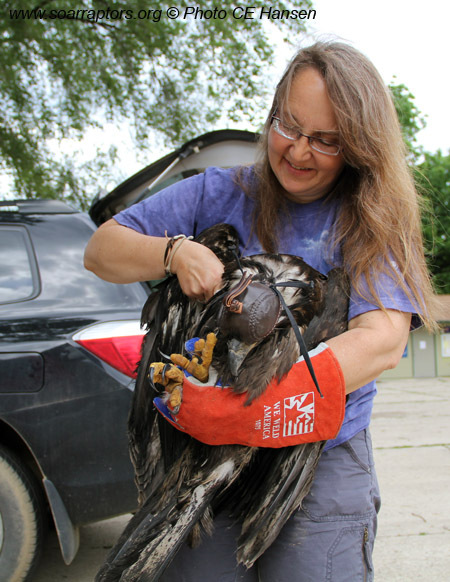 SOAR has permits with the US Fish and Wildlife Service and the Iowa DNR, these permits allow SOAR to do wildlife rehabilitation and to hold some non-releasable birds to use for educational programs. We hope to add Decorah to our education staff. His wing does not droop, so he is able to move around easily in a big pen. He is eating well, bathing, and getting up to perches. These are all things that we look for when deciding on candidates for education. Since he really has not had much of a chance to be wild, he is quite moldable and should condition nicely to being around people. We will put the request into our agencies to add him to our permits. This is not the outcome that we hope for when we admit a bird. We want them all to be able to go free, back to the wild. Many have injuries that are too severe, they die or need to be euthanized. Many we can return to the wild for a second chance, Boone Forks and Des Moines are well on their way down this path. Then we have the almost category. We did everything we could for Decorah, the fracture was just too close to his shoulder. Update – The Des Moines juvenile was released where found on 10/5/14. Boone Forks was released on 11/1/14 at Whiterock Conservancy. The juvenile from Dickinson County could not use her elbow joint and was euthanized. The HY juvenile Decorah was added to the Live Eagle Exhibition Permit. Project AWARE and Clay were released at SOAR on 6/18/15. SOAR gets to inspire so many people each year with a close-up view of a live raptor. I know we are planting many sparks of conservation as we go. One person might be convinced to switch (or convinces a friend to switch) to non-lead ammunition and tackle or someone might start a project to make power poles safe or someone makes a contribution to protecting quality wildlife habitat or someone pursues a career in conservation. Everything has a beginning, a spark. I’m hoping this will be another beginning for Decorah and he will be the spark for many other good things for eagles and wildlife. If you managed to read all the way through, you will have seen a lot of names! Thank you to all of SOAR’s dedicated volunteers and supporters and natural resources staff. It has been a summer of many people helping many eagles. These are all connections that I’m betting we will rely on in the future.